You can also find additional items on Peaceable Primate Sanctuary’s Wish List on Amazon, and purchase through Amazon, or through the retailer of your choice. By clicking on our Amazon Smile logo at the bottom of our home page, you can donate a percentage of everything you buy through Amazon to PPS. However you choose to send things, please make sure to include your contact information, so we can properly recognize your gift. Building a Real Sanctuary for Baboons. 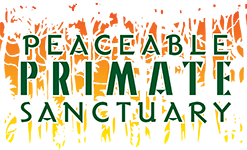 Peaceable primate sanctuary is a 501(c)(3) tax-exempt nonprofit organization in the United States.